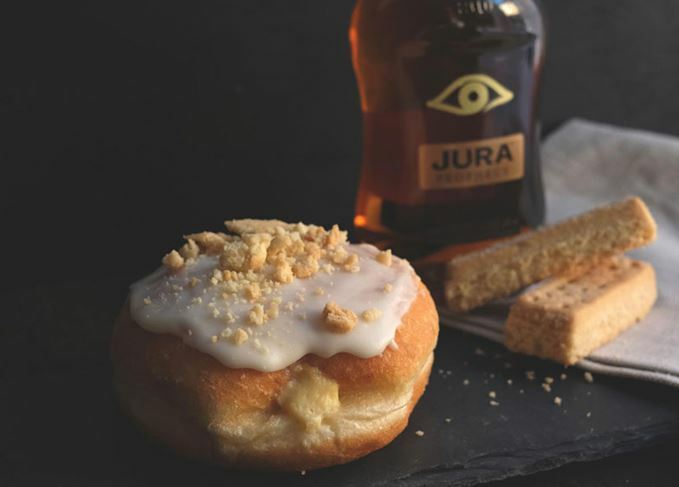 Crosstown Doughnut & Coffee Bar has partnered with Jura to create a Scotch-infused doughnut in its central London shop. The new doughnuts have Jura single malt in the glaze, filling and shortbread topping. Created as part of Crosstown's Single Series, the Jura doughnut has been infused with Jura's heavily peated Prophecy expression. While the Soho-based shop’s sourdough will make up the body of the doughnut, Prophecy has been used to make the cream filling, glaze and the shortbread garnish (see video below). Crosstown said that Prophecy’s heavily peated profile will lend a smoky edge to the sweetness of the doughnut, the flavours of which represent the island. All the partners in the Single Series, which celebrates single-origin produce, cultivate their ingredients within one region. Crosstown has already produced a Nicaraguan coffee doughnut and will next month create one using single-origin chocolate. If the idea of booze-laden baked goods has you salivating already, the Jura doughnuts can be found in Crosstown’s Soho store as well as at market stalls in King’s Cross, Broadway Market and Spitalfields for £3.80 per ‘nut until the end of December 2015. Why, why, why on Islay? There are better places to build a new distillery, reckons Dave Broom. How about Tiree?